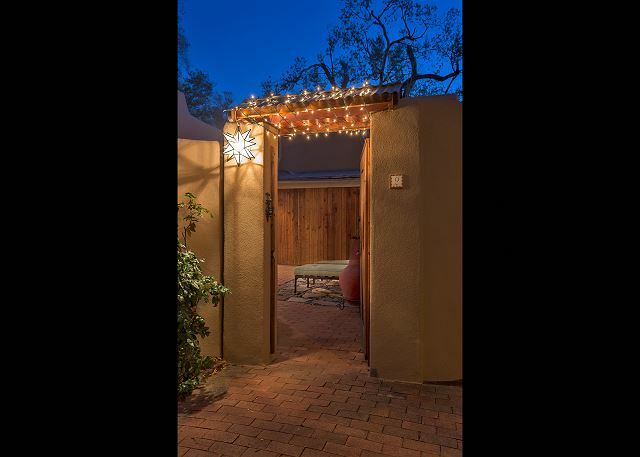 Within walking distance, this perfect casita is located in a quiet compound close to both the Historic Santa Fe Plaza and the Historic Arts District of Canyon Road. 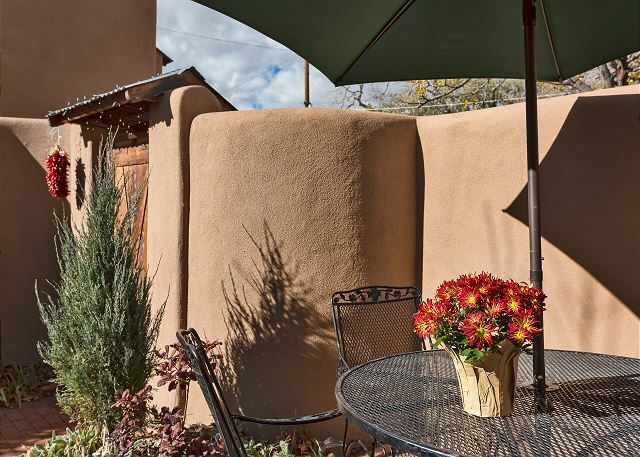 It is truly a hidden gem tucked away on one the quiet streets of the South Capital area that offers the true flavor of Santa Fe. This sunny one bedroom vacation rental with separate study includes a queen bed and queen sofa sleeper, is light, bright, and open offering all the comforts of the perfect home away from home. The open living room, dining area, and kitchen is wonderfully accommodating for whatever the occasion may be. A wood burning stove adds to the charm of this great room. 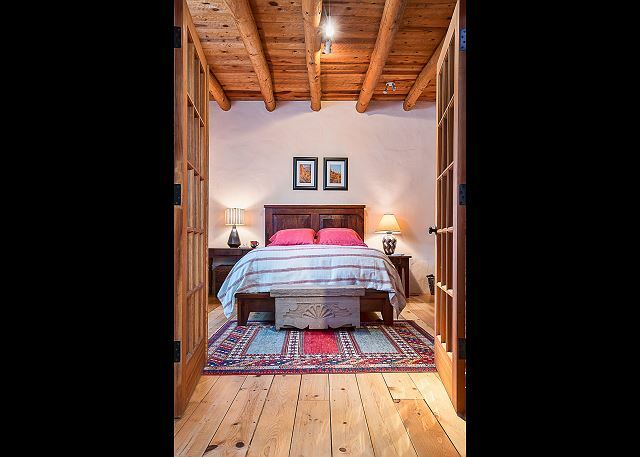 Professionally decorated with leather furnishings including traditional Santa Fe appointments. The queen bedroom, plus the queen sofa sleeper in the study accommodates a total of 4 guests. The gated patio offers al fresco dining and lounging. Washer/Dryer, cable television, and wireless internet. Approximately 1000 square feet. This was our second stay and we love the privacy, location and home-like feel of this casita. You can walk everywhere safely. 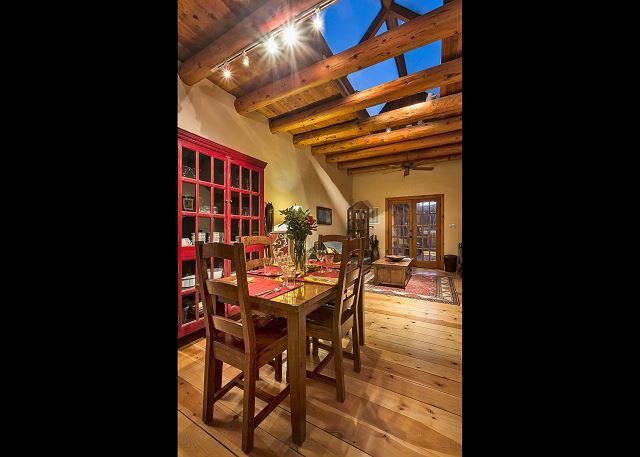 I love the glass ceiling, wood beams and wolf range. Private gated courtyard is a plus. Very classy place and we had the best stay. Everything was super clean and would recommend it to anyone. The home was beautifully decorated. I grew up in NM and haven't been back in years and this felt just like home. We loved it! Lovely rental. A bit of a hike to the Plaza, but generally happy w/ location. Close to grocery stores etc. The reason I gave this a 4 star is twofold: neither maser bed nor sofa bed were comfortable. Also, the charming french doors did not have screens so could not be left open. That said, the place is charming, including the private patio, and we heard no noise from neighbors despite this being a contiguous complex. Also nice to have assigned parking space. The casita was in a great location: walking distance to the farmer's market and the town square. Location was quite and secluded. The home was completely furnished, clean, a/c worked great and patio area was great for entertaining. Overall an excellent experience. Would highly recommend this property. My husband and I spent 4 nights at this beautiful and clean condo; we loved the big living room skylight and the condo's rustic charm. The property mgmt company was very professional and left us a nice welcome note, Santa Fe brochures and maps. There was a vase of colorful flowers on the kitchen table upon our arrival that we got to enjoy during our stay. We walked to the new Railyard within a few minutes as well as to a lovely French bakery and restaurant, Clafoutis, for a great breakfast/lunch. We would definitely stay here again! We stayed at Casa Encantador after being reassigned to Santa Fe for work. My wife, daughter, dog and I stayed for three months while our home was being built. Donna from Santa Fe Vacation Rentals was more than superb working with our unique booking situation and creating a wonderful stay for us. She went above and beyond to make it as relaxing as possible. 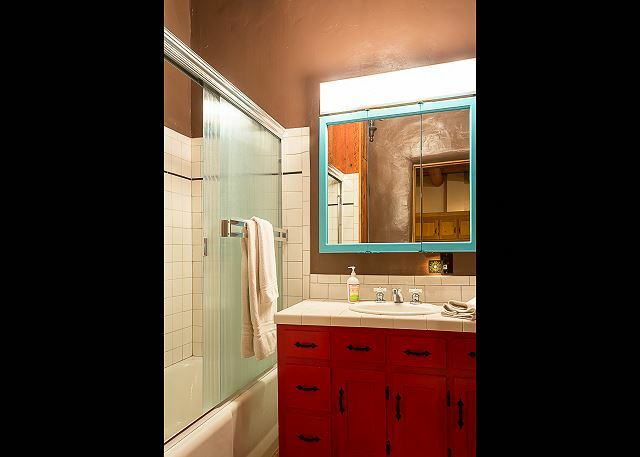 The property was even better than the listing represented. It had all essential items for a long term stay and was spotless. The location is wonderful for walking to the Railyard or the Plaza and there are many restaurants in walking distance. 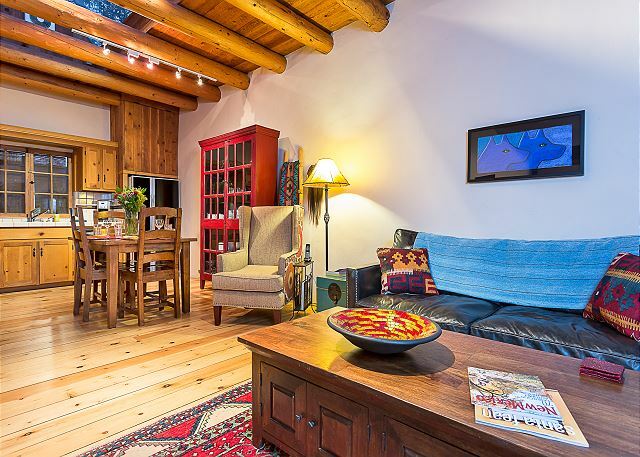 We would recommend this home and Santa Fe Vacation Rentals in general to any friends or family visiting the area. Casa Encantador Santa Fe. Excellent! 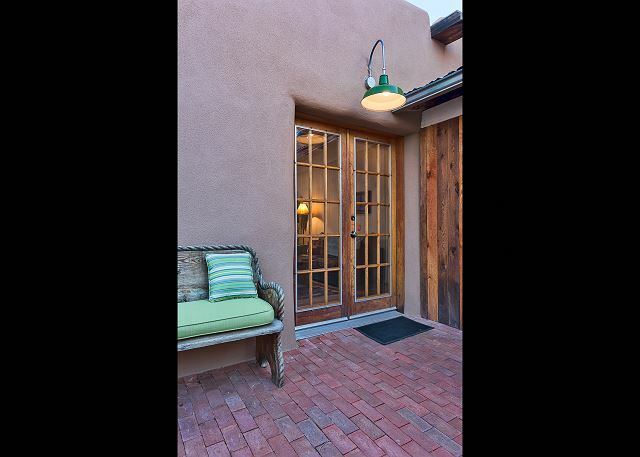 Loved staying at Casa Encantador with Santa Fe Vacation Rentals. Great location to everything central. Quiet, spacious, private, comfortable, well furnished & very clean! This is the second time we have stayed at this lovely condo. There were 4 of us on this trip and we had plenty of room. 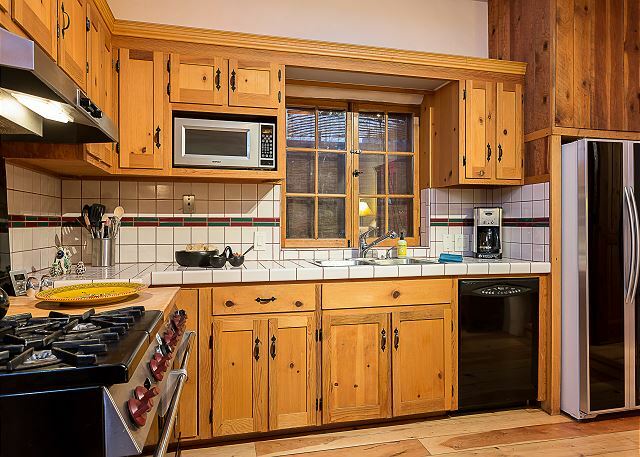 The house is immaculate furnished with great appliances if you are looking to cook while you are there. Plenty of places deliver food and a Randal's is about 2 miles away. The square is a few blocks away. I would recommend this condo for a weekend couples getaway, a business trip if you dont want to stay in a hotel or for a family trip. The second bedroom has a pull out couch that my kids enjoyed. There was plenty of firewood outside, the courtyard is great and it is close to everything. The casita was great. The pre-arrival note was very detailed and accurate and the home was very clean and even had some lovely flowers on the table for us. The courtyard was great and we enjoyed it in the late afternoons after shopping or golf. The property was also very quiet and well maintained. The surrounding area was great for walks with our dog and everyone we met was very dog friendly. Wonderful location. Well maintained. Perfect for a few days or an extended stay. My husband and I stayed here for 4 days and it was great for the two of us. It was just a short walk to the plaza and railyard and it wasn't too far. Everything was very nice and clean in the house. We would definitely stay again! Casa Encantador is the best kind of place to stay--a comfy, relaxing basecamp from which to explore the surrounding area. The private courtyard, bright living area, and spacious bedrooms made it a great place to relax. The quiet neighborhood was close to everything we wanted to see in town, including within walking distance to the Railyard where we enjoyed the weekend artisan shows. The house was very clean and had everything we needed. There were multiple brochures about Santa Fe attractions left for us, and we enjoyed seeing Meow Wolf, doing some hiking and eating at Paper Dosa and Tomasita's. The three of us had plenty of room in the house and the pullout sofa bed in the office worked perfectly for our 12 year old daughter. She was excited to have her "own" room. We also loved having the washer/dryer in the unit. We would definitely stay again! This was exactly what we were looking for - cozy, 2 bedrooms, close to everything, nice kitchen, cute patio, etc. We also enjoyed the game/book selection, and the nice bedding and towels. We had a good mix of exploring the city and relaxing in a beautiful spot. Thank you! This condo has been beautifully renovated and has a wonderful small private patio with grill and outdoor fireplace/chimenea, as well as a grofessional grade gas stove in the kitchen. Much prettier than any of the rooms I have stayed in at La Posada. Highly recommended. Great spot, very quiet. Perfect for a couple. Well stocked kitchen, though we did not use it much, taking advantage of the local restaurants. Pleasant, comfortable interior and a nice outdoor space. What I always thought it would be, great .